My name is Simon Gardner. I am 30 years old and am a Little Gem Crop Manager for G’s Fresh Produce, based in the Cambridgeshire Fens and also the East Coast. My day always starts in the kitchen at home looking at the weather and the soil moisture content of my fields on my iPad. This gives me accurate data on what is happening outside and allows me to tweak my team’s day before they arrive at work. My day can involve a huge range of things! Seeing my planting or cultivations team to ensure the best possible land and soil conditions for planting. Walking the crops to make decisions on their management. Working with the workshops that develop new machinery and modifying existing machinery to improve performance. Working with seed breeders to develop varieties, improving the crop’s growth habits but also improving the product for the consumer. Managing and understand the farm’s performance and accounts to ensure I am managing the business in a profitable manner. Managing and developing my team to improve their level of knowledge, allowing them to make decisions and get more involved with their career rather than a job. All this leads to a changing daily routine with a mixed balance of being outside in the crops and in the office. The main key skills I would say are to have a high attention to detail, to be well organised, highly self-motivated, and a clear communicator with the ability to motivate a team. For me it would be the fascinating bigger picture of where the entire crop we grow actually goes. Just imagine, several million fridges per week: that’s a lot of salad! Also the range and variety of the crops we grow, as well as growing and motivating my teams of people. No two hours in a day are the same, but the best is seeing a delighted shopper picking up something you have produced and putting it in their basket in the supermarket. I think most people would be amazed at the amount and level of technology used when growing crops, from analysing soil moisture sensors and crop water usage through remote sensors sending data to an iPad. This kind of interesting stuff becomes less unusual by the day as we strive to innovate in all areas of the business. I've always had a passion for farming and after graduating from university I was growing arable crops in a desert. This meant what I grew had much quicker growing cycles than are typical in Europe. This led me to the fast pace and high demands of working with fresh produce closer to home. 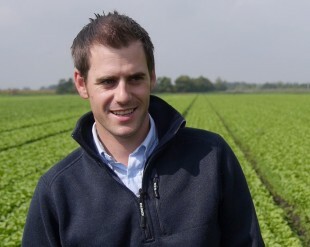 It was the fast paced environment and attention to detail of fresh produce that inspired me in the sector, but also the responsibility of managing a large team and the high value of the crops grown. A career in the fresh produce farming industry is very exciting. G’s in particular are always looking at new technology, whether that’s automated planting of lettuce and driverless GPS tractors, through to working with the breeders to improve existing varieties and develop new products. We’re always striving to be at the forefront of the industry. This is great to be a part of but G’s also recognises that as a leading supplier it needs leading employees that it invests in, develops and trains. That makes it an exciting place to work. I started out getting a degree in Agriculture as this would give a good base to build a career on. Since leaving university I have gained vocational qualifications such as BASIS. I’ve also gained qualifications outside of agriculture to support my managerial role. These have been in areas such as people management and health and safety. Understand and gain experience in different sections of the fresh produce business. As a younger person it is very difficult to understand the complexity of a fresh supply chain, but this would start to piece it together and provide invaluable experience later in your career. You have got to have a passion for a career in farming. If so, get stuck in and join a likeminded team who love doing what they do and always want more. Work hard and gain as wide experience as possible in different areas of fresh produce. It really helps making sound decisions when you have a thorough understanding of the wider business and industry. I think there will be more and more technology used to improve efficiencies and lower production costs. Drones will be frequently flying above fields, giving better data, and allowing more precision applications to fields. Harvesting will be mechanised and hopefully the countryside will have better mobile network coverage.